I know that Thanksgiving isn’t all about the food, but let’s be real… it’s definitely a big part! 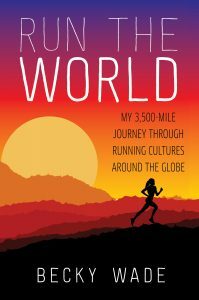 While turkey, mashed potatoes, and my mom’s killer pumpkin pie won’t be on the menu here tomorrow, I’m going to share the foods that will be, and that have become a regular and scrumptious fixture in my Ethiopian diet. 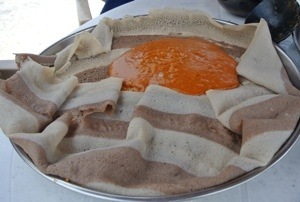 First of all, no meal in Ethiopia is complete without injera (above), a flatbread made of teff flour with the texture and appearance of a thin, spongy pancake. Both the white and brown varieties are great sources of iron, calcium, protein, and fiber- about as good as it gets in a single food and pretty perfect fuel for runners. 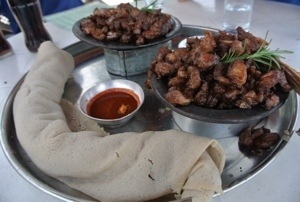 In a typical meal, injera is either eaten with meat (like the picture above) or rolled out onto a big platter and then covered in one of the infinite takes on wat, or stew (chicken, beef, vegetable, lentil, etc.). Everyone partaking in the meal then crowds around the platter and, using right hands only, breaks off a piece of injera and uses it to mop up the stew. I love the communal aspect of eating here and I also appreciate the pre-meal hand-washing custom in most restaurants. One of my favorite dishes to eat with injera is shiro (above), a reddish stew made of ground chickpeas and often onions, tomatoes, garlic, ginger, and a popular local spice called berbere. It comes in 2 types- tegamino (plain) and bosena (beef). Both are delicious, but all 3 of the Yaya girls named bosena shiro as their very favorite food. The presentation of the shiro is almost my favorite part- it’s always served bubbling hot in a small cauldron, just waiting to be dumped on the injera and devoured. Another standard meal is called tibs (above), which is basically small pieces of cooked vegetables or meat (usually beef, goat or lamb). Tibs comes in a hot metal plate, often still cooking atop a small stove (like the picture above) and with peppers, onions, and other cooked vegetables. The dishes are good on their own, but I’ve become obsessed with a spice called mitmita (African birdseye chili peppers, cardamom, cloves, salt, and often other spices like cinnamon, cumin and ginger) that I douse on most things, shiro and tibs especially. I bought a big bag of mitmita in a market the other week so I’ll be able to bring a little taste of Ethiopia home for my family and friends. 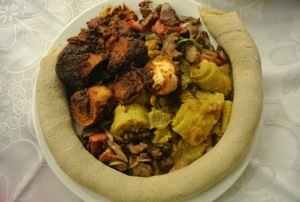 Undoubtedly the most fun thing to order is firfir (above), which literally means “broken.” It’s small pieces of injera that are either broken up or rolled up and then cut, and soaked in sauces and spices. 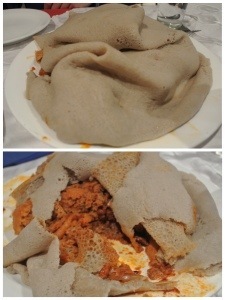 My favorite uses a tomato sauce and comes buried under a blanket of injera. One meal that I haven’t braved yet but that is a favorite among many Ethiopians, is kitfo (above), raw beef marinated in mitmita and spiced butter. 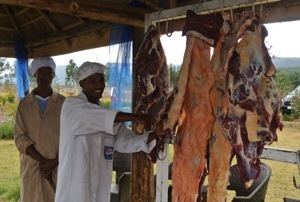 I got to watch a traditional Tigray wedding reception at Yaya Village this weekend (which was awesome, but more on that later), and the butchers were arguably the most popular guys in attendance. Happy Thanksgiving, y’all! My words are inadequate to express how much I love and appreciate all of you back home and all of you whom I’ve met and imposed upon in the past 4 months. No matter where you are in the world, and whether your culture even celebrates this holiday or not, I encourage you to take some time to enjoy your families and friends, let them know what they mean to you, and give your tastebuds a little wakeup call with something they don’t normally come across. Love that you love the food. 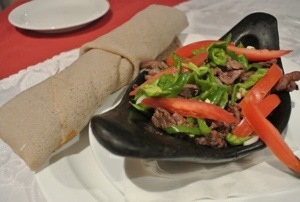 Great news is there are several great Ethiopian restaurants in Dallas. I have also found markets to buy injera and all the right spices. 🙂 A word of caution on kitfo, have a friend that got very sick after eating it there. Think our systems just aren’t ready for it! Hate to see you get sick.